But is there a form to found the restored title screen patch anyways apart from turbo and relocalized? No but you won't need one. Turbo will basically allow you to add it to any hack. Why yes in fact. I'm currently hard at work fixing the last few bugs in this hack and I'm working on a project I'm calling Secret of Mana: World of Balance that balances difficulty, eliminates unreasonable grinding, fixes bugs, reworks weapons and spells, adds quality of life improvements, and incorporates Relocalized as well. One of my favorite things is it changes the end game sequence so that all three players have something to do. Only Primm will have to cast Mana Magic to unseal the Mana Sword. 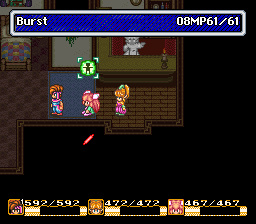 Popoi gets a new spell unlocked called Manaburn that can penetrate the Mana Beast's Wall spell and it'll be strong enough to actually damage it. I'll add some dialogue about how the Mana Knight with the Mana Sword lets off a lot of energy that Popoi can redirect into a new spell. You'll notice the Sword Randi is using is called the Ragnarok. That's the new 9th level sword. The Mana Sword exists outside of the 9 weapon levels. Kethinov's weapon hack is one of the many that will be fully incorporated into this one. I should probably mention that this isn't a new video. This is right after I finished that hack so I hadn't yet made the new spell icon for Manaburn. I actually turned the Mana beasts defenses down for the video. It's stats will be modified so that it puts up more of a fight. I'm also hoping to rework it's AI to get it to start using the rest of it's attacks. This sounds absolutely amazing and I can't wait for it! Keep up the great work and I look forward to its release!! 3. Proper Caser is made redundant by Relocalized and adds nothing. 4. VWF Edition is currently included in Relocalized and is not necessary. And also in that .ips that I supplied does not have the MSU-1 (which can be added first) and Mana Early Luna because I think it's entirely useless. It's probably a file size issue. Good find. That's again for doing this. Hey is this hack compatible with Binarynova's scroll hack? if yes, how to install it along with this hack? I have to ask.. So now that Kettle Kin has been replaced by Death Machine, does that mean Kettle Kin is now just an unused boss? If so you could possibly make Goblin Village a place you can return to and have Kettle Kin as a boss there who drops an additional sword orb. I love the updates (especially regarding fortitude and stamina mentions) it all goes a long way and I do have to agree all the title screen subtitles do kinda clutter it up. Have you considered adding a splash screen prior to the title. It should accomplish giving the necessary props without taking away from the new title screen. To be honest though I would be fine with just the word 'Relocalised' or perhaps a subtitle. It might be worth keeping the 'Secret of Mana' text yellow to help differentiate between the remake and this but I feel that is a pretty subjective thing. About to release a fairly large update. Thought this time I'd talk about the changes before I do a release to get feedback from people. -Removed "VWF Edition: Relocalized" subtitle from title screen. -Renamed "Hit %" to "Accuracy %"
-Renamed "Tinkly Barrier" to "Lucid Barrier"
-Renamed "Silver Chain" to "Silver Whip"
-Renamed "Chain Flail" to "Morningstar Whip"
-Renamed "Chain Hammer" to "Hammer Whip"
-Renamed "Diamond Chain" to "Diamond Whip"
-Renamed "Gigas Chain" to "Gigas Whip"
-Renamed "Blue Sorbet" to "Blue Bavarois"
-Renamed "The ultimate chain." to "The ultimate whip." -Renamed "Gas Cloud" to "Bluster Gas"
-Renamed Shadow x1, x2 and x3 to Shadow Boy, Girl, and Sprite respectively. -Renamed "Frost Gigas" to "Frost Giant"
-Renamed "Sleep Flower" to "Sleep"
-Continued to resist the urge to change "Flail of Hope" to "Vampire Killer"
I essentially did a full overhaul of the system messages. For the most part the "Rabite's poisoned!" format is gone. I've replaced with a more uniform "Rabite: Poisoned" This change was made to make the most out of the hardcoded 28 character limit for short window messages. Enemy names were expanded or reduced to 14 characters in length in a previous update.
" Lucre!" -when opening a chest. I'm heavily considering a couple other small changes. First, of all I'm thinking about renaming "Analyzer" to "Scan", "Libra", or "Analyze". It's currently called "Detect". "Detect is a direct translation from Katakana but "Detect" feels kind of awkward, especially alongside other final fantasy named spells. Secondly, I'm considering renaming "Burst" for "Flare". "Burst", like "Detect" is a direct literal translation. However, "Burst" just kind of sticks in my craw for some reason. It just seems kind of awkward to me for some reason. I mean, it's clearly supposed to be a Green Flare spell. Finally, I'm considering replacing the Burst's Icon with a more accurate green one. Why not restore the square legalece to be like closer to the japanese release title screen? Why no restore the square legalece to be like closer to the japanese release? I thought about it but I feel like it takes away from the art. That's why I dropped it all together. Like all the "Chain" names better, "Morningstar Whip" just sounds bad. Excellent decision! Where did you move it to? What makes you think he moved it somewhere else? He said "Removed", not "Relocate". Unfortunately, we're limited to 16 characters. "Morningstar Chain" doesn't fit. One of the things this localization does is try to make a little more sense of the game's assets. The "spears" category, originally called "lances", was renamed "polearms" because their was too much overlap with the "javelins" which were originally called "spears". Visually the "spear/lance" weapon looks like a spear but it's icons feature a number of different kinds of spears. The Javelin weapon also features a number of different kinds of spears both in icon and name. The Whips really shouldn't be an exception. They certainly aren't flails. They have far too much range for that. When you wield them, they crack. I promise you a flail doesn't crack when you wield it. It thuds, clanks, and might make a whooshing sound if you swing it around hard enough. Even a chain whip isn't really whip. It has more in common with a rope dart than it does a whip. Changing the entire category back to whip was a deliberate choice to make better sense of it's icon and it's not one that I'm likely to change back. I just deleted it. My title was big and clunky and if I'm willing to delete that for the greater good then why should I give a fig about representing Nintendo and Square's respective copyright or licensing claims. Ah, I see. Seems like a normal thing to wanna have some sort of mention about the hack, so I figured you must have moved it elsewhere. For my LA hack, I had some info about the hack on the title screen, but ended up moving it to the file select screen so it doesn't clutter the title screen. Removed completely works, too! Adds to the player immersion. Personally I think it should go back in. Just the Square 1993 bit though. I love the art as much as you do but its just an attention to detail that I always did not like in title screen alterations. That's just my preference. Why the Square logo though? Why not "Relocalized" subtitle instead or "Press Any Button". Aesthetically, all 3 text suggestions do the same thing. They frame the picture by balancing out the title and filling the negative space. If I'm going to put something in there for the sake of putting something in there, the utilitarian in me is more likely to be put something useful than something nostalgic. I'll probably just go with "Relocalized" but my mind isn't set in stone about this yet. Hmm. I definitely get what you mean about the aesthetics point of view. Personally, I'd rather either have the Square logo or nothing at all. Can we talk about these changes? These ideas are the one's I really want opinions on. I don't have a strong opinion on this, but I wouldn't change the spells to conform to the FF series, unless they originally did in Japan. I know the Mana series is a pseudo spin-off of the FF series, but I feel that anything that gives it it's own unique identity is a good thing.